It's been almost two years since scientists declared Leonardo Da Vinci's only universally recognized self-portrait as "damaged beyond repair." The iconic work, which dates back to the 1500s, accumulated unwelcome blotches, fungi and spots, putting the delicate drawing in danger. With the very life of a work of such magnitude at stake, most agreed attempting to intervene and preserve the piece was not worth the risk of destroying it completely. Well, Leonardo devotees, there is hope. A new "non-destructive and non-invasive diagnostic method" hopes to help illuminate the proper route to saving the vanishing red chalk drawing before it's too late. 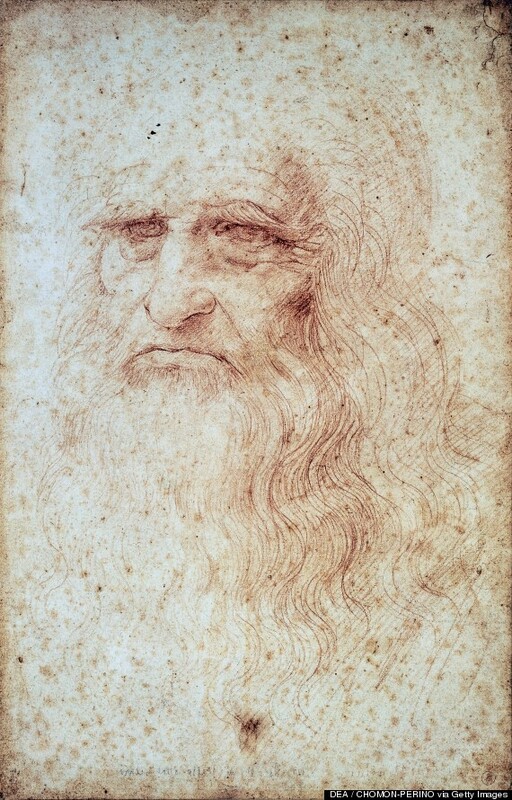 Leonardo's drawing, thought by many to be either a self-portrait of the Renaissance man himself, or perhaps a depiction of his father or uncle, was drawn on paper composed of linen, cotton fibers and hemp rags. The piece, likely completed in Turin, Italy, is currently stored in a locked in a temperature and humidity-controlled vault in the city's Royal Library to prevent further damage from light. For much of the 20th century, however, the work was displayed to the public, ultimately resulting in a yellowing effect on the image. The combination of this yellowing with the red chalk medium makes the precious image look as though it's fading from sight. In 2012, a team of researchers from Italy and Po­land analyzed the level of light-absorbing compounds, known as chromophores, in the work's cellulose. These compounds absorb blue and violet light while reflecting red and yellow-toned light, which explains the yellowing of the paper. The scientists first devised a way to measure the concentration of chromophores, i.e. the culprits of the discoloration. They then conducted simulations based on quan­tum me­chan­ic­s to cal­cu­late what col­ors the chromo­somes ab­sorb the most, measuring how much light was reflected and absorbed from the work at different wavelengths of light. The team compared their findings with those of other pieces of paper from various conditions and eras. "We were able to eval­u­ate the state of de­grada­t­ion of Leonardo da Vin­ci’s self-portrait and oth­er pa­per spec­i­mens from an­cient books dat­ing from the 15th cen­tu­ry,” explained Adri­ano Mosca Conte, a re­search­er at the Uni­vers­ity of Rome Tor Ver­gata. "By com­par­ing the re­sults of an­cient pa­pers with those of ar­ti­fi­cially aged sam­ples, we gained sig­nif­i­cant in­sights in­to the en­vi­ron­men­tal con­di­tions in which Leonardo da Vin­ci’s self-portrait was stored dur­ing its life­time." The scientists found the work's condition to be reminiscent of that of ancient papers stored in humid environments, "perhaps a closed, dank space," specified Mauro Missori, a researcher at the National Research Council in Italy. "As a follow-up, they'd like to do a second analysis to see whether the painting is continuing to degrade, or whether its fading has stabilized now that it is kept in better conditions." You can see the details of the study in full here. "The sadly poor state of preservation that characterizes Leonardo's self-portrait today is the result of the inappropriate conditions in which it was historically stored," the study concluded. "Unfortunately, a lack of sufficient knowledge, both physical and chemical, of the mechanisms responsible for paper degradation prevented good conservation strategies from being adopted in the past. "Our non-destructive and non-invasive diagnostic method provides a quantification of this priceless artwork's present state of optical degradation. A periodic repetition of the same analysis not only would provide an ongoing quantitative assessment of its rate of degradation (and therefore an estimation of its 'life expectancy') but also increase our understanding of the inevitable degradation processes that are underway. Needless to say, such information is invaluable to restorers and conservators." Determining the level of damage to such a precise degree can hopefully enable preservationists to better determine how to save the vanishing portrait. The knowledge can also further preservation assessment in regards to other ancient works of art.